Why is ankle sprain treatment important? Ankle sprains are so commonplace they may not seem like a big deal, but the reality is that returning to activity before complete ankle sprain recovery can potentially lead to increased injury risk and more severe issues in the future, like chronic ankle instability. Whereas they are often categorized with sports injuries (for good reason), it is certainly possible to sprain an ankle when performing even routine tasks like going up stairs or walking on uneven ground. Your best path for avoiding ankle instability is to take time for complete ankle sprain recovery. If you are tempted to resume physical activity, remind yourself that it can put you at risk for future ankle sprains and instability. Ankle sprains are some of the most common foot and ankle problems humans experience, but this doesn’t mean they should be taken for granted. Make sure you take the time to heal completely before resuming high impact activities. Not sure how long that might take? Come in and see us here at Richardson Podiatry Center and we can help. Call our Richardson, TX office at (972) 690-5374 for more information, or use our online form to connect with us right now. What happens when an ankle is sprained? Ankle sprains are common sports injuries, yet not many people are familiar with what happens when an ankle is sprained. To help you understand this injury, let’s start by looking at the anatomy of the ankle. This anatomical structure consists of several bones—specifically, the lower leg bones (tibia and fibula), the ankle bone (talus), and the heel bone (calcaneus)—connected by various ligaments. The lower leg bones sit upon the ankle bone, which sits upon the heel bone. There are two ankle joints – the “true” ankle joint and the subtalar joint. The true ankle joint is located where the leg bones connect to the talus. The subtalar joint is formed where the talus connects to the calcaneus. An ankle sprain occurs when a twisting force on the foot or lower leg causes ligaments to extend beyond their intended range. This leads to swelling, bruising, ankle instability, and pain. Generally, you can care for an ankle sprain at home, but keep in mind that we are here to help if you need assistance or the condition is not improving. Call Richardson Podiatry Associates for additional information at (972) 690-5374 or request an appointment with our Richardson, TX office online. Can I Care for a Sprained Ankle Myself? Whether you have a small ankle sprain from stepping in a pothole or a severe twist where you can’t stand up, your injury needs prompt treatment so that you can avoid chronic pain in the future. The first step of at-home care for a sprained ankle is the RICE method, which stands for rest, ice, compression, and elevation. Immediately after your injury, rest the ankle. If you need to get up, use crutches. Don’t place weight on the ankle until you know the extent of your injuries. If you try to walk it off, you risk re-injury, instability, and arthritis. Before you ice, wrap your ankle in a compression bandage. This is going to immobilize the injured area and act as a barrier between the ice pack and your skin. Elevate your foot—above the heart is best—and ice the area for 10 to 20 minutes to reduce pain and swelling. Take it off for 10 minutes and repeat. As soon as you can, we recommend that you call Richardson Podiatry Associates here in Texas at (972) 690-5374 for a diagnosis. We can take an X-ray of your ankle and determine the next steps for therapy and treatment. How Do I Know if I Have an Ankle Sprain? A roll of the ankle can happen to anyone—a small slip off of a curb or a collision in a sports game can leave you with searing pain. Even a little twist or turn can be very painful, but you may not know how much damage has occurred. 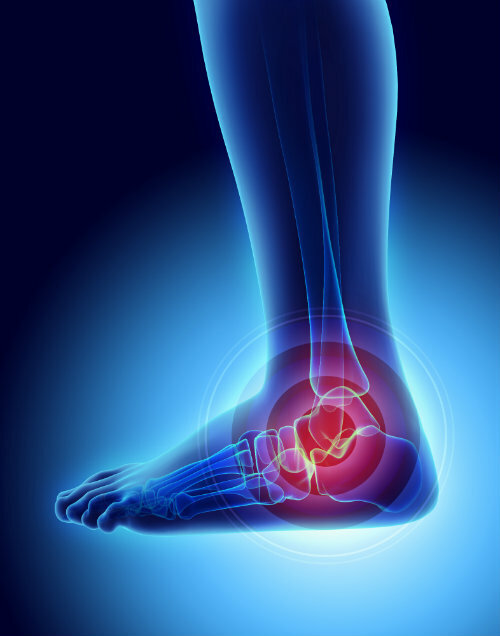 An ankle sprain stretches the ligaments surrounding the joint beyond their limits. There are several degrees of stretching or tearing, but the symptoms are similar, just in different degrees. Most often, a telling sign that a sprain has happened is the presence of pain and then swelling. When capillaries are broken, the leaking blood contributes to the inflammation. The increase in blood may also cause the area to feel warm, and your ankle may feel tender to the touch. You may also feel tenderness when you try to move or walk. Lastly, bruising is another symptom but it is not always present even if a sprain has occurred. If you sustain an ankle injury, please contact our office for an accurate diagnosis. You can reach Dr. Gene Reister at 972-690-5374 or find more information online. ?What happens when an ankle is sprained? ?Can I Care for a Sprained Ankle Myself?